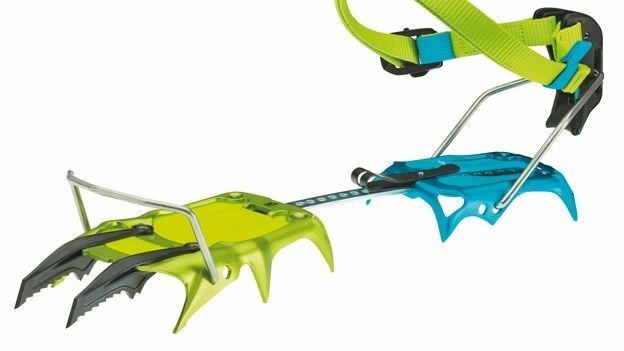 Feast your eyes on the worlds lightest dual-point crampons, made with a revolutionary 3D forming technique by German climbing company Edelrid. Weighing in at a featherlight 340g per foot, the award-winning Edelrid Beast Lites can be switched between monopoints and dual front points, as well as two sets of bindings for semi-automatic (B2/C2) and automatic (B3/C3) boots. The company has come up with a new way of forming foot metalware – called “Deep Drawing” which involves a piece of sheet metal, aluminium in the case of the Beast Lite, being laid flat before being radially drawn into a forming die by a mechanical punching action. This results in the material being formed into a crampon-shape, but without losing strength - this allows for the use of thinner materials. Although the crampon bodies are made of light but relatively easily-blunted aluminium, the front points are replaceable forged steel so should wear well. Edelrid recommends the Beast Lite is used for ice and mixed climbing to minimise wear on the aluminium. Lightness comes at a price. The 12-point Beast Lite is supplied with anti-balling plates for RRP £240, and is set to launch in Winter 2014.